Black candy has long been a favorite especially at Halloween but what many people don’t know is that most black candies contain either anise or licorice. Both of these have healing properties, vitamins and minerals but don’t tell the kids this sweet treat is good for them. This Halloween give black candy with a clear conscience. Anise, also known as anis or aniseed grows as a flowering plant in areas of the Mediterranean and Southeast Asia. It is the fruit of the flower that is known as aniseed and which contains the ingredient anethole. Anethole is a proven anti bacterial and anti fungal which is used in many ways other than creating delicious black candy. Anise is chewed to freshen breath and it is also worn to ward of mosquitoes. In some countries anise has been used by women for centuries to enhance fertility and limit the discomfort of other feminine conditions. Most commonly though anise is used as a flavoring in food, candy and some of the most delectable liqueurs in the world like ouzo and sambuca. In AcandyStore.com anise is a key ingredient in a number of favorite confectionary products including anise squares, bears and black taffy candy. Most people would be surprised to hear that licorice is in fact a legume, like a bean or a pea. It is perfect for making sweet treats of course because of its wonderful flavor and aroma but also because in its natural state, it is actually considerably sweeter than sugar. Besides being a wonderful black candy base and flavoring for less palpable necessities like medicines, licorice candy contains healing properties within its elemental ingredients. The healing properties of licorice are mainly attributed to the compound glycyrrhizic acid. 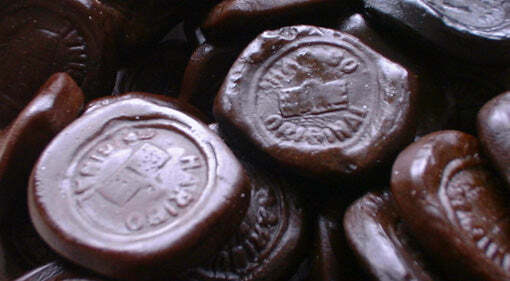 Licorice is commonly used in Japan for the control and treatment of viral hepatitis. Outside of Japan the strong anti viral component of licorice has been tested in the treatment of sarcoma and herpes and is used as an aid for healing stomach and duodenal ulcers and to soothe stomach aches. For more severe stomach ailments licorice can be used to treat ileitis, leaky gut syndrome, irritable bowel syndrome and Crohn’s disease. Although not a cure for these ailments, licorice has been shown to alleviate the symptoms and discomfort associated with them. Some studies have shown initial results which suggest that licorice may inhibit brain enzymes involved with producing stress related hormones which have been connected to mental decline in the elderly. In other countries, like China, licorice is used to harmonize the body and relieve spasmodic coughs.Â Herbalists use licorice in anti cancer formulas and believe it is effective in auto immune conditions like lupus, some allergies, scleroderma and rheumatoid arthritis. Naturopaths utilize licorice benefits to relieve mouth ulcers, peptic ulcers, as a mild laxative and a topical antiviral for other ulcerations and sores. The uses and healing properties of licorice are such that you may want to save it for after all the other Halloween candy is eaten and the children are in need of a soothing stomach and calming remedy, then bring out the black candy.